A few months ago John and I saw an idea for infusing mango in tequila in a magazine. We had some vodka leftover from a recent party so we decided to give it a try. We infused the vodka with strawberry, lemon and basil. Slice the lemon and strawberries. Add a few slice marks to the basil so the flavor infuses into the vodka a little easier. 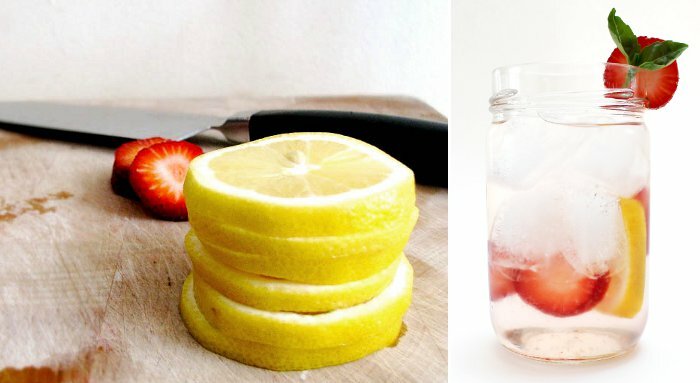 Add lemon slices to a mason jar and pour the vodka over it. Add the basil leaves and using a gentle pour add some more vodka. 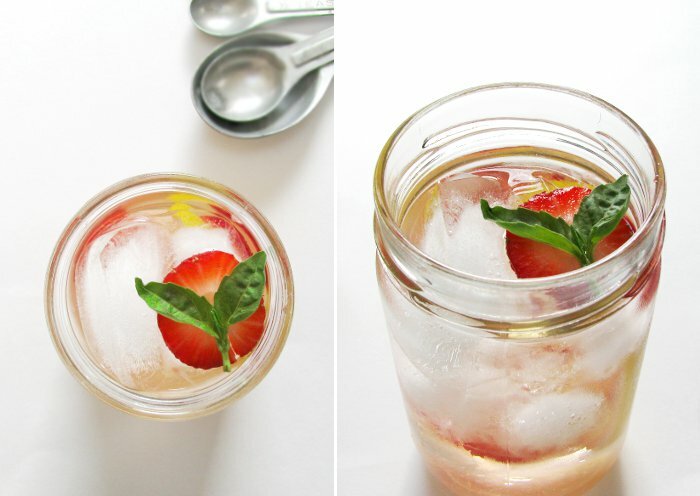 Add the strawberries and fill the remainder of the mason jar with vodka. John squeezed the juice of one full strawberry and the juice from the heal of the lemon into the mix to get the infusion going. Add the cap and let the mason jar sit in a cool, dark place for two weeks. -Pour the vodka over ice with bits of fruit from the infusion mix and garnish with a fresh lemon slice on top, fresh strawberry and sprig of fresh basil on the rim of glass (as shown below). -Add the infusion to champagne, prosecco or soda water for a light, refreshing twist on a spritzer. -For a fruity, fun cocktail add the infusion to classics like cranberry juice, orange juice, pineapple juice etc. Infused liquor could be a clever gift idea and it seems kind of versatile - you can choose tequila, rum, vodka, etc. and pair them with fruits and complimentary herbs. The drinks you see in the photos used an infusion that sat overnight. We have a second infusion going that has been sitting for ten days. The vodka is a dark pink color. The strawberries are white as their color has infused with the vodka. The fruit flavor will be really prevalent in that infusion and the fruits themselves will add a nice extra kick of flavor when added to beverages.